MSD Powersports Blaster FI Programmable Controller UNKNOWN - RPM - Racing Performance Motorsport - Your source for performance parts and accessories. From the trails to the track, MSD Powersports new Blaster FI fuel and ignition controller delivers unparalleled performance for your Yamaha® Raptor 700. Select from 10 performance calibrations or create your own custom fuel and ignition curve for any engine configuration. The Blaster FI incorporates factory style connectors for a direct plug-in installation on 2008 and newer Yamaha Raptors. Once connected, you can simply turn a dial to use one of the 10 different calibrations built into the Blaster FI, or connect your laptop and program your own timing and fuel map for any modifications. Plug-in the MSD Blaster FI to your ATV and open a new window of performance opportunities! Choose from ten preset dyno tested calibrations or connect your PC and map your own fuel and ignition tune to meet the needs of your ATV’s modifications. 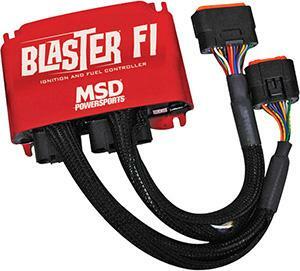 For top end performance, off-corner acceleration and overall power, the MSD Blaster FI delivers. Map a custom program via your laptop. Modify timing, fuel and RPM. 10-Pre-set fuel & Ignition maps. Includes MSD View software and mounting bracket.